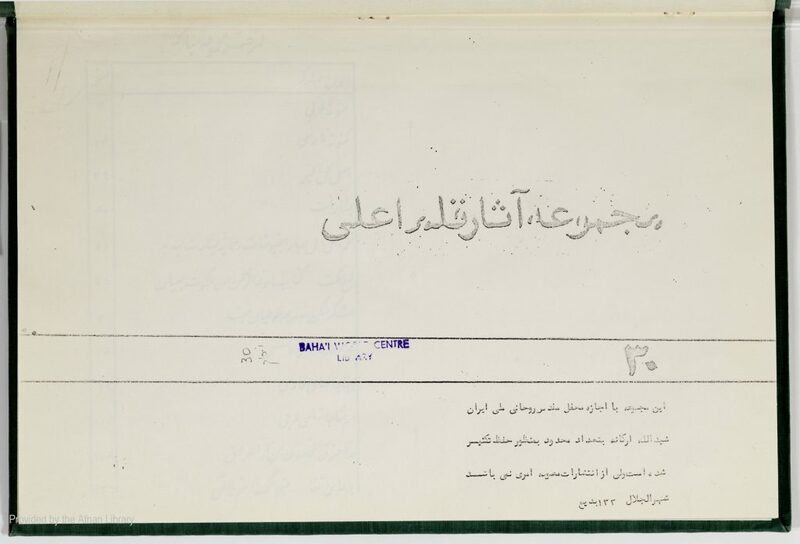 Description: Collection of Named Tablets, Prayers and Poems of Bahá’u’lláh. Includes Hidden Words (p. 2), Asl Kullu’l-Khayr (p. 39), Bishárát (p. 42), Lawh-i Hikmat (p. 52), Shikar Shikan Shavand (p. 70), Lawh-i Ahmad (p. 76), The Fire Tablet (p. 124), Mathnaví Mubárak (p. 131). Table of Contents at beginning of volume, p. 3-4 of PDF (see link above). Manuscript, 2 unnumbered pages of Table of Contents + 176 pp. (92 pp. of PDF).